Wax myrtle is a popular, native landscaping shrub used prolifically as an evergreen screen. The shrub is endowed with many other useful qualities, though most people have forgotten them. There was a time in America’s history when medical doctors and candlestick makers knew of wax myrtle’s valuable uses. Medicinally, wax myrtle acts as a stimulating astringent and a nutritive blood purifier, known as an alterative. In addition to wax myrtle, the common names indicate its historical candlemaking uses: wax berry, candle berry and bayberry. The name bayberry (Myrica pensylvanica, a Northeastern species) might jog one’s memory, as it is a common scent for winter holiday candles. Early European settlers made taper candles from the waxy residue remaining on the surface of the water after boiling the green berries. The wax was then made into dark green candles scented with the shrub’s warming aroma, which was an upgrade from the smell of rancid lard coming from candles made with animal fat. According to Dr. Francis Porcher, a Civil War surgeon and botanist, during the 1860s the women of South Carolina’s Lowcountry utilized the abundant natural resource of Southern wax myrtle (Myrica cerifera) berries to make large amounts of candles and soap in order to become less reliant on the North. Medicinally, wax myrtle acts as a stimulating astringent and a nutritive blood purifier, known as an alterative. Finley Ellingwood, an early 20th century medical doctor, wrote, “Wax myrtle is a remedy for those conditions where the vital powers are at a low ebb. It aids the nutrition, stimulating the absorption of food, and promotes the restoration of depraved blood.” He would use wax myrtle during a patient’s convalescence from malaria, and to expel the body of mercury after a toxic calomel (mercurous chloride) treatment. Ellingwood also suggested wax myrtle for when the capillary circulation of mucus membranes was “feeble,” as in sore, spongy gums or in boggy, sinus cavities indicated by the dark, swollen, puffiness under one’s eyes due to a lingering sinus infection, or chronic allergic rhinitis. Typically, this type of sinus condition is without inflammation and is accompanied by excessive white mucus. When using wax myrtle medicinally, the root bark is the most potent part of the shrub, but not the easiest or most sustainable to obtain. Fortunately, the leaves, when boiled for at least 20 minutes, also can be used. 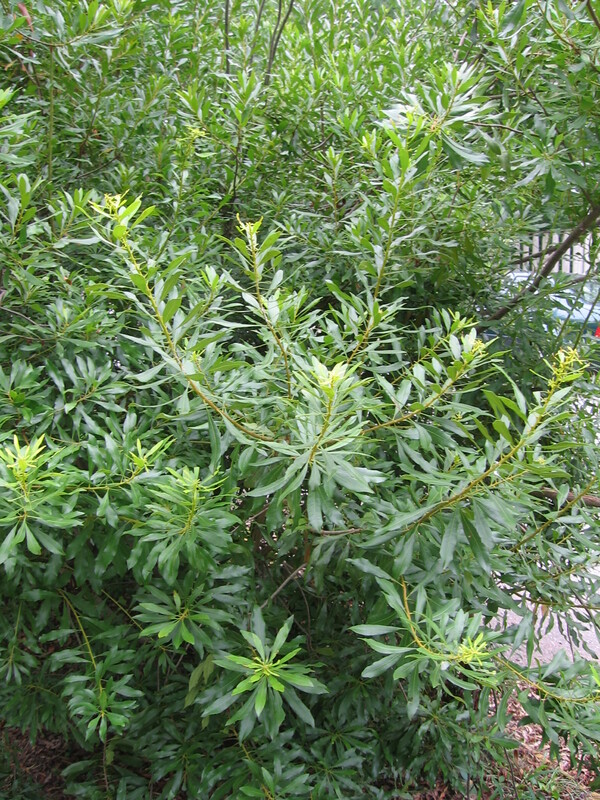 Although the American Herbal Products Association states wax myrtle is safe, people with hypertension and pregnant women should be cautious if using it. In Athens, the wax myrtle shrub is easy to find. It’s utilized by local horticulturists at the University of Georgia and at the State Botanical Garden of Georgia. Graceful, evergreen branches with varying shades of glossy green, narrow, deer-resistant leaves – which have a warm, winter holiday smell when crushed – make the plant a desirable landscaping screen. Its only drawback is that the branches can split under a heavy snowfall. Otherwise, this low-maintenance, multifaceted plant can help prepare one toward self-reliance. Bayberry candle and soap-making recipe: From Francis Porcher’s, 1863 text, Resources of Southern Fields and Forests, Medical, Economical, and Agricultural. Being Also a Medical Botany of the Confederate States; with Practical Information on the Useful Properties of the Trees, Plants, and Shrubs. Reprinted (1991) by Norman Publishing: San Francisco. For candles, add the berry wax to bees wax, adding strength to the candle and stretching the amount of wax to more candles. Then pour into taper molds, following usual candle instructions for inserting the wick. “As one of the complaints of soap-makers is the difficulty and expense of obtaining the grease, it will be well for us to avail ourselves of a production of nature, found abundantly in our lower country. “To three bushels and a half of common wood ashes add half a bushel of unslaked lime. This being well mixed together, put into a cask capable of containing sixty gallons, and fill up with water. In 48 hours the lye will be strong enough to float an egg. Then draw off, and put from 6-8 gallons of it into a copper kettle capable of containing 25 gallons. To this add only 4 pounds of wax myrtle. Keep constantly boiling for 6 hours. For the first 3-4 hours pour in occasionally a supply of strong lye, the whole frequently well stirred with a ladle. After 6 hours boiling, throw 2 quarts of common large grain salt into the kettle; leave one hour more to simmer over a slow fire. The liquor must be placed in tubs to cool for 24 hours. Take out the soap, wipe it clean; put it to dry. “The produce of this soap when it was weighed the next day was found to be 49 pounds of good, solid soap, from the materials and by the process above mentioned. At the end of six weeks the soap had only lost a few pounds from the evaporation of its watery particles.